If you had to explain your book in a tweet (140 characters), how would you describe it? Where on earth do you write your books? I do most of my writing at home – a tiny flat in North London. However, because I understand that it’s good for my immune system to sometimes expose myself to other human beings, I occasionally work in the West End: either from the University College London library or a coffee shop. Do you have any bad habits while you write? Loads. Probably my worst is the fact that I compulsively chew things as I write – pens, pencils, phone cases, cutlery – and by the end of the day, my desk is scattered with shards of plastic. I’m sure there’s probably something quite Freudian about this, but I try not to over think it. What is your favourite part about being published? The amount of pride it brings my grandparents. Godot from Beckett’s Waiting for Godot. Hell, it would be good just to meet him, let alone befriend him – after all, he must be the most elusive character in literature. And imagine the bragging rights if I actually managed to track him down! If you could live in any fictional world, which world would you choose and why? I’d quite like to live in the world evoked in the Shrek series of films. I really love how its writers appropriate fairy-tales and fables and redeploy them in clever, comedic ways – it’s a thoroughly postmodern piece of cinema. I think inhabiting that world – with its talking animals, fantastical creatures, and irreverent humour – would be pretty good fun. What is favourite thing about writing crime books? The plotting is definitely the most rewarding (and difficult) aspect of writing in this genre. I always plan the entire novel before starting, and this involves me dreaming up a number of complicated situations – which amount to complex riddles – then spending many, many long hours figuring out how to resolve them. It’s frustrating as hell, but really good fun. If you had to give some advice to aspiring authors, what would you say? Make sure you plan things thoroughly. At least, that’s what works for me. I personally find it far easier to see a project through when I know exactly where I’m going. Richard Davis graduated from University College London in 2011 and Cambridge University in 2012. The Saul Marshall series was born from Davis’s extensive travels around the United States and his long-standing obsession with thriller fiction. He lives in North London, UK, with his girlfriend. Eleven year old Olly has a very special delivery – a 3D printing machine, stamped with PROPERTY OF M.O.D and BRITISH SPACE AGENCY. WARNING. DO NOT TAMPER, which has magical powers… It has a name, it speaks, and it can print ANYTHING Olly asks it to – the coolest new toy, a room full of chocolate cake – but what Olly really wants is… his dad. If you had to describe your book on twitter (140 characters), how would you? Kids get access to super billion pound 3D printer. They print sweets and a swimming pool then a replica of their Dad. Things go very wrong! What gave you the inspiration for this book? I was reading a science magazine article about 3D printers. I was thinking about all the amazing things we can make now, from musical instruments to food to car parts. I started thinking about what we will be printing in ten or twenty years time, and so invented a machine that could print Anything and Everything. I just need to become invisible, for an hour or two so that my family don’t require my services! (I have 4 children) and maybe not too much howling in the background. I write on my laptop anywhere they can’t see me! What would you create if you could create anything? You can’t ask me that! I don’t have one, I have many. And my favourite children’s books now are different to when I was a child, or teen. But when I was little I loved Enid Blyton, Roald Dahl and Susan Cooper (The Dark is Rising) I loved The Secret Garden by Frances Hodgson Burnett, When I was a bit older I loved Margaret Mahy’s The Changeover, now I am reading to my own children I love ‘The Pencil’ by Allan Ahlberg, and I remember being blown away by Skellig by David Almond, in my twenties. There are so many brilliant children’s books around now it is impossible to choose. Who is your favourite author ever? Again, I don’t have one. Some days a favourite just won’t do and someone completely different is the winner. I love the twisted, dark and crazed imaginative world of the Gormenghast books by Melvyn Peake, I am also a die-hard fan of Jilly Cooper. I love Robert Harris’s thrillers. I also just read ‘Elizabeth and her German Garden,’ by Elizabeth von Arnim, which was a breath of fresh air even though it was first published over a hundred years ago. I also just read ‘Skinny Dip’ by Carl Hiaasen, which was irreverent, wicked, rude and funny. I must try and read some more of his books. What would you say to a child who wants to be an author when they grow up? Read, read, read, fill your mind with words and stories. Read comics and newspapers and cereal packets as well as books. If you find reading difficult, listen to audiobooks. Nag your parents to buy you books and comics. Join the library and use it. Be nosey about people. Notice interesting things about them, be it the way they spit when they say ’Thank-you,’ or the shaved eyebrows, or the eye-watering perfume, or the skull earrings, or the deep etched frown-wrinkles. Look for the story in people. Boredom is also very important if you want to be creative. Give yourself time between activities to get so bored you start inventing things. Boredom is a portal to creativity. Are you working on another book? If you are, can you tell us anything about it? Ally Kennen has been an archaeologist, museum guard and singer-songwriter. Her dark and thrilling teen novels have been nominated for over eleven literary awards. She lives in Somerset with her husband and four children. A killer is targeting hate figures in the Catalan city of Girona – a loan shark, a corrupt priest, four thugs who have blighted the streets of the old quarter – leaving clues about his next victim through mysterious effigies left hung on a statue. Each corpse is posed in a way whose meaning no one can fathom. Which is precisely the point the murderer is trying to make. Elisenda Domènech, the solitary and haunted head of the city’s newly-formed Serious Crime Unit, is determined to do all she can to stop the attacks. She believes the attacker is drawing on the city’s legends to choose his targets, but her colleagues aren’t convinced and her investigation is blocked at every turn. Battling against the increasing sympathy towards the killer displayed by the press, the public and even some of the police, she finds herself forced to question her own values. But when the attacks start to include less deserving victims, the pressure is suddenly on Elisenda to stop him. The question is: how? 1. Where did you get the ideas from these books? The whole idea for the first book began when I was researching for a travel guide. I was in the city archives in Girona when I came across a whole load of legends about the city. The more I looked, the more myths and stories I discovered – it was tremendously exciting. One of the stories was of a statue of the Virgin Mary that stood over one of the medieval city gates. She was called the Virgin of Good Death, and she was there to give a final blessing to condemned prisoners as they were led outside the city walls to be executed. The gate was not far from the archive, so I went to find the statue and it was there in a niche above the archway. It was seeing the statue and the idea of the legends that sowed the seed of someone using Girona’s history and myths to bring what they thought was justice to the city, announcing their attacks using the statue – a blessing for the condemned. That probably comes down to rock music and cups of tea. I always start a writing session listening to music through headphones to immerse myself. I associate every character with a song or piece of music, so if I’m going to write about a specific character, I listen to their song to get me into the zone. For Elisenda, I’ve got about half a dozen songs – most of them by her favourite Catalan rock band, Sopa de Cabra – and I listen to a song or two depending on the mood I want for the scene I’m starting with. Another of my rituals is to leave a handwritten note the previous session that roughly tells me what the first line I’m writing the next day has to say. Having that to hand makes it easier to get the first words on screen – always the hardest moment for me. And the final ritual is tea. Getting up from my desk to go downstairs and make a cup of tea is a great moment for gathering my thoughts and thinking of the next scene while the kettle’s boiling. The problem is I nearly always let the tea go cold when I start writing again! 3. Are you a plotter or a pantser? Ha, I reckon I’m probably somewhere between the two. EL Doctorow said that writing was like driving at night – you know where you’re going, but you can only ever see as far as the end of your headlights at any one time. And that’s probably true for me – it often feels like having a road map with pages missing and tea stains on the important bits! I roughly know how things are going to end up, although that changes more often than I’d like to think, but I don’t always know what’s going to happen along the way. I try to map out the key scenes (knowing full well they’re never written in stone), then make a few notes on how I think the story might get to those points and what has to be included and which characters should do and say what, and then I just start writing. As the story develops, other strands and characters present themselves, but the milestone I’m heading for usually stays pretty much the same. Then once I reach that, it’s onto the next milestone and so on until the first draft is finished. 4. If you could be any fictional character, who would you choose and why? As a kid, I always wanted to be William from the Richmal Crompton books. He was always well-meaning, but still got into scrapes and adventures – when I was a child, it always struck me as being a pretty neat way of going about things! As an adult, it might seem strange (and I dread to think what it says about me), but I’d quite like to be Bernie Gunther from the Philip Kerr books about a German detective during WWII. Almost like a much more radical William, he’s an ordinary man trying to be good in bad times. An iconoclast and anti-Nazi, he has to work with the bad guys to work against them. He’s constantly trying to set things right as far as he can in a world going horribly wrong, and he’s often thwarted but still keeps going. I’d love to have his steadfastness and courage, and the front to stand up to scary authority figures the way he does. 5. If you could live in any fictional world, which would you choose and why? There are plenty of fictional worlds I’d love to visit, but I’m not sure I’d want to live in any of them – that sounds far too scary. The obvious one here is Terry Pratchett’s Discworld. I’d be fascinated by Unseen University and sentient furniture, but I know I really wouldn’t want to hang around somewhere as terrifying as Ankh-Morpork too long. I’d want to know that I could get out of there any time I wanted. The same is probably true for the alternative Swindon of Jasper Fforde’s Thursday Next novels. In these, Thursday is a literary detective chasing fictional characters who escape from the books they’re supposed to be in. She has a pet dodo called Pickwick and she gets to meet all the greatest characters in literature when they decide to go AWOL. It would be great to meet Jay Gatsby and Jane Eyre, but then imagine being stuck in a world where Moriarty and Hannibal Lecter live just around the corner. I’d also want to visit the Aberystwyth of Malcolm Pryce’s hugely imaginative Louie Knight stories, about a 1930’s-style gumshoe in a parallel Wales where beautiful Welsh spies dance the tango and druids run speakeasies. But even that’s too frightening a prospect. So, instead of living in any of them, if anyone could arrange a short holiday to these worlds, I’d be at the front of the queue. Just don’t ask me to stay there forever. 6. If you had to give advice to aspiring authors, what would you say? That’s a really hard question, as we’re all motivated in different ways. One of the pieces of advice you often hear is to write what you know. I’d say that more than that, you should write what you feel. I got my first book deal because I was so incensed by a travel guide unfairly denigrating a part of the world I loved that in a wave of self-confidence I’ve never felt before or since, I wrote to them and told them I could do better… and they called my bluff. I ended up writing four travel guides about Catalonia for them. The same goes for the Elisenda series. I have a passion for Catalonia and for the many things about the country that I love and that I admire, especially the way they maintain their traditions while embracing change. When there is something like that – it can be a place, a person, a cause, a historical period, anything – it’s so much easier to harness that passion and let it come across in your writing. You also can’t always know everything, but you can feel it or empathise with it. No matter how much I research, there are always going to be aspects of Elisenda’s life and her work that I can’t know, but by using what I feel and my own similar experiences and by transposing that onto her situation, I can put myself in her place and (I hope) convey her world in my writing. The secret is to know your passions and let them take you somewhere you might not have thought you’d go. 7. When you’re not writing, what do you do all day? That’s easy… thinking about writing. I also work as a freelance translator from Catalan and Spanish into English. Ideally, I try to translate all morning, leaving the afternoon and evening free to write, although sometimes that doesn’t always go to plan as a rush translation will come in and I have to drop what I’m writing and get it done before the deadline. Even when I’m translating, though, ideas come – especially as the stories are set in Catalonia and the texts I translate are in Catalan – so I keep a notebook next to me all the time to jot anything down. It’s surprising how much the day job can send you off on a train of thought when you least expect it. When I’m not doing either of those, my life is a hectic social whirl of sitting at home reading, watching TV or listening to music… I also love walking – the Brecon Beacons are half an hour one way and the Gower is half an hour the other, so we’re spoilt for choice – and going to live music or stand-up in Cardiff. My wife’s a painter, so we often go to gallery opening nights and exhibitions, which are great fun – artists are a pretty cool crowd! And, of course, I’m forever planning my next trip to Girona. 8.​ Do you have any more books that you’re working on? I have a few Elisenda stories swirling around inside my head, but right now I’m working on a new idea that I’m finding really exciting. It’s another police procedural, but very different, both in terms of time and place. The story is set in Paris in 1940 in the early days of the Nazi Occupation. It’s a period that’s always fascinated me, and at the moment, I’m devouring newsreels, films and books from the time to immerse myself in the atmosphere. Lastly, thank you for hosting me on Big Book Little Book today. Chris was born in an ambulance racing through a town he’s only returned to once and that’s probably what did it. Soon after that, when he was about two months old, he moved with his family to West Africa, which pretty much sealed his expectation that life was one big exotic setting. He later studied Spanish and French at university, and straight after graduating, he hopped on a bus from Cardiff to Catalonia where he stayed for the next twenty-four years, falling in love with the people, the country, the language and Barcelona Football Club, probably in that order. Besides Catalonia, he’s also lived in Grenoble, the Basque Country and Madrid, teaching English, travel writing for Rough Guides and translating. He now lives in South Wales, where he works as a writer and a Catalan and Spanish translator, returning to Catalonia as often as he can. 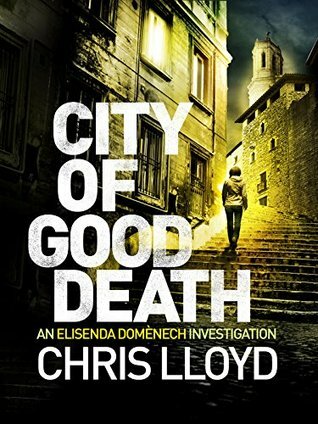 He writes the Elisenda Domènech series, featuring a police officer with the newly-devolved Catalan police force in the beautiful city of Girona. The third book in the series, City of Drowned Souls, is published on 6 February 2017.